Today there is more photography being made, consumed, and used for more purposes than any time in history – and there’s no sign of things slowing down. Major advances in image capture, image manipulation, and distribution have redefined what is possible. MTSU's Photography program is designed to help students see the world in new ways and capture what they see as, commercial photographers, visual artists, or photojournalists. The program is implemented in a state of the art digital facility, and also maintains traditional and alternative process darkrooms. This unique blend sets the program apart and establishes a foundation for the students to build upon and evolve with the medium of photography. MTSU’s Photography concentration is in the Department of Media Arts. Imagine 180 running feet of empty display space—how would you decide what to hang where? That describes where Jackie Kerns Heigle and her practicum students find themselves a couple of times each semester. Students get to do more than unpack shipping crates and clean glass—they handle images and help decide placement. “They hold what they know is important work in the field and feel they are connecting with history outside the classroom,” explains Heigle, current curator of Baldwin Photographic Gallery, located on the second floor of Bragg Media and Entertainment Building. 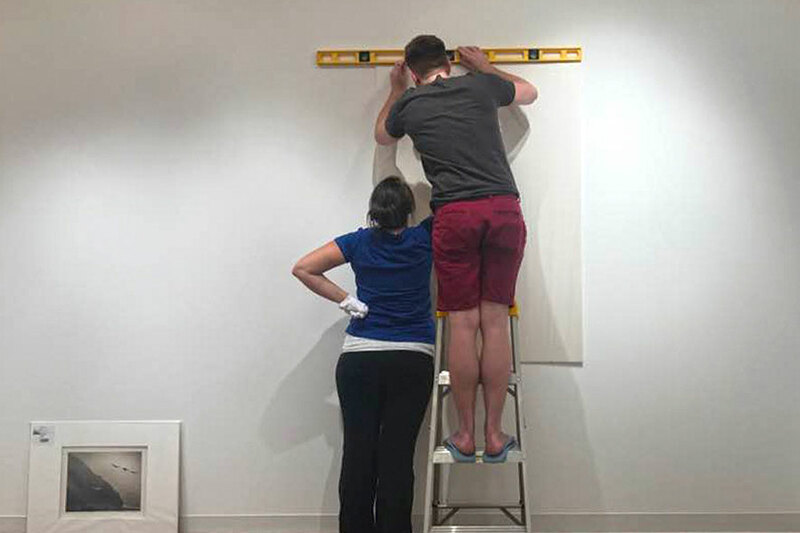 “Students have never considered someone encountering work for the first time—they have to approach an exhibit layout from a different perspective. I think their involvement is very empowering.” Heigle points out that hanging a show is a series of processes—from learning why they must wear gloves to the importance of sequencing work. The overall process begins more than a year before as shows are sought, vetted, negotiated, and scheduled. Heigle says the selection depends on “knowing what’s out there, who’s up and coming, who’s emerging, and who’s at the retrospective point. Choosing four shows a year is hard. We want the shows to be inclusive in many ways and to be relevant to the times.” Founded by Harold Baldwin, who began MTSU’s photography program, the gallery exists to inspire students, faculty, and the public. MTSU professor Chris Harris recently had three of his early photographs of impoverished blacks from the sugarcane fields of Louisiana selected for use in a new film on author-poet-activist Alice Walker. Harris’ photographs come from a collection that Walker kept in her files for more than 30 years. They were discovered while doing research for the film. 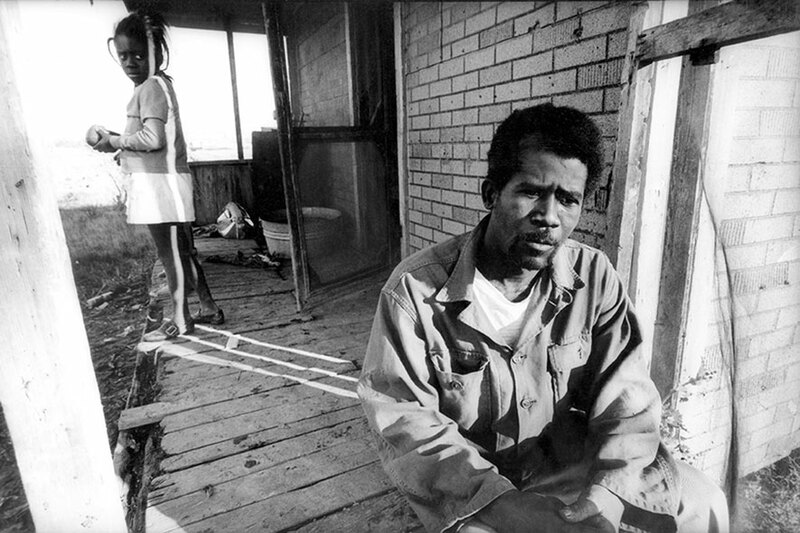 A photograph Harris shot of the author writing in her Jackson, Miss., home in 1977 was also chosen for the film, Alice Walker: Beauty in Truth, premiering summer 2013. Walker was the first African-American woman to win the Pulitzer Prize in fiction, for her 1983 novel The Color Purple. Harris shot hundreds of assignments for TIME, Newsweek, and the New York Times. His textbook, Visual Journalism, was recently released by Allyn & Bacon. Students may choose from four Bachelor of Science (B.S.) degrees in the Department of Media Arts. Students may minor in any program that is not under the same degree as their major. Animation majors are required to have an Art minor. A Master of Science (M.S.) degree is available in Mass Communication. Introduces simple and multiple image photography, principles, methods, theory, and practice for both Photography majors and non-Photography majors. Explores digital camera anatomy, operating, and handling while discussing proper in-camera exposure, metering, focusing, shutter speeds, apertures, depth of field, and camera accessories. Basic principles of lighting, design, and image composition discussed. Digital darkroom techniques and image manipulation using tool such as Photoshop included. Emphasis placed on the DSLR (digital single lens reflex) camera. Students responsible for providing a DSLR camera for the class. Must have working knowledge of the Macintosh computer system. Three-hour lecture plus up to three-hour lab per week. Black and white chemistry based darkroom printing and film processing with tactile materials. Introduces the fundamentals of photographic practice and procedures combined with aesthetics, theories of visual perception, and photographic vision. Emphasis placed upon the in-camera exposure, development of black and white film, the traditional silver print, conceptual theory, problem solving, and portfolio presentation. Class format includes demonstrations, lab work, assignments, and critiques. Emphasis placed on the SLR (Single Lens Reflex) camera. Students responsible for providing a 35mm SLR film camera and darkroom supplies for the class. Evolution of photographic imagery from the invention through contemporary work. The movements, themes, and genres developed by individual photographers. Prerequisite: PHOT 2050. Further investigation into the exposure and development controls of black and white chemistry-based darkroom photography as a method of expression and communication. Students responsible for providing a 35mm SLR (Single Lens Reflex) or medium format film camera and darkroom materials for class. Prerequisites: PHOT 3110 and ART 1610. A continuation of PHOT 3110 with emphasis on the technical and conceptual applications of the medium from a creative perspective. Both chemistry-based darkroom prints and digital printing discussed and demonstrated in a hybrid manner with emphasis on details toward the craft, honing a personal vision, and final portfolio presentation. Students should bring examples of previous black and white darkroom work to first session of class. Prerequisite: PHOT 2050 or instructor approval. Use of DSLR (Digital Single Lens Reflex) cameras in addition to flatbed scanners as image capture devices and digital printers as image output devices. Software programs, applications, and discussion topics focus on camera operation, file formats, and the aesthetic and ethical issues surrounding photography. Software applications used to explore creative and experimental possibilities for processing and manipulating photographs. Prerequisites: Admission to candidacy; junior standing, and permission of instructor. Practical experience in an on-campus setting. A minimum of 75 hours work for each hour of credit. Required to be present and work for the class during evening and weekend times during the semester when needed. Note: Total university credit for internship, practicum, and individual problems courses cannot exceed 6 credits. Pass/Fail. Prerequisites: Admission to candidacy; ART 1610 and PHOT 3110 or consent of instructor. Basic theory of contemporary color photography while establishing a history of the medium. Requires use of both film SLR and DSLR cameras for capture and output is in the traditional color darkroom with a roller transport unit and in digital printing. Color theory and color vision discussed and how color works demonstrated. Prerequisites: Admission to candidacy; senior standing and permission of department chair or instructor. Practical experience for advanced students in a professional setting. A minimum of 75 hours work plus other assignments will be required for each hour of credit. Note: Total university credit for internship, practicum, and individual problems courses cannot exceed 6 credits. Pass/Fail. A continuation of PHOT 3810 with emphasis placed on details toward the craft, honing a personal vision, and final portfolio presentation..
(Same as EMC 4060.) Prerequisites: Admission to candidacy; PHOT 3120 and PHOT 3810; EMC 3200/PHOT 3200; or consent of instructor. Principles and practices of photography, including documentary, news and feature portraiture, photo stories, photo essays, and photo layout. Emphasis on newspaper assignments, participation in campus publications, portfolio editing and production, and internship preparation. DSLR (Digital Single Lens Reflex) camera required. Prerequisites: Admission to candidacy; junior status with declared major. Background in ethics and law for the visual communicator. Focus on ethical philosophies, ethics case studies, and solutions to ethical dilemmas; copyright, privacy, and libel law. Prerequisites: Admission to candidacy; PHOT 4060 and/or consent of instructor. Builds on the basic information given in PHOT 4060. Advanced photographic techniques, including digital imaging, information on ethics and law as they pertain to the image maker, along with an examination of different styles of photojournalism addressed by classroom demonstration, lecture, and practical assignments. Prerequisites: Admission to candidacy; PHOT 4060. Studio illustration lighting photography of food, fragrance, beverage, jewelry, glass, and flatware with an emphasis on tabletop setups. Introduces full frame DSLR cameras, large format view cameras, and professional lighting equipment. Problems in advertising photography including responsibilities under truth in advertising. Lecture/lab with three to six hours per week. Prerequisites: Admission to candidacy; PHOT 3040, PHOT 3120, and PHOT 3810. Editorial illustration photography for fashion, corporate, annual report, style publications with emphasis on paper background and the studio cyclorama wall. Exploration of various career opportunities and business practices open to the professional photographer. Introduction to full frame DSLR cameras and professional lighting equipment. Those students using color darkroom print material must have taken PHOT 4040. Students will photograph a semester-long photo project of personal choice in a documentary style. Research on the aspects of and photographers practicing contemporary documentary photography. This required course introduces students in the visual art programs to academic and career opportunities in the visual arts. The course will address the following topics: how to begin creating, preserving and documenting an art portfolio; career opportunities and internships; transfer opportunities; career options; student services; study skills including time management, research, writing, note and test taking, and presentation skills. This course is presented by art faculty, visiting professionals and alumni from various disciplines and specialties. An introduction to Western art based on an aesthetic and historical evaluation of artists, styles and cultures from the prehistoric period to the 18th, 19th century. Work will be viewed through visual presentation and field trips to museums and exhibits. The turn of the 20th century saw an explosion of changes which in turn redefined our visual vocabulary. This course introduces the major artists and movements of 19th and 20th century western art. Avant Garde art of the 19th century, the rise of high modernism and its subsequent decline in the postmodern era will be examined. Issues considered are artistic intention, spirituality in art, the birth and development of abstraction, art with political agendas and the implicit historic contexts of modern art. Work will be viewed through slide presentation and videotape. The history of Chinese, Japanese, and art from India will be examined from prehistoric times to the present. Comparisons to the most familiar example of Western art will be offered whenever they add depth to the material. Various oriental media such as jade, lacquer and ivory calligraphy, landscape are studied in depth. This visual arts course in intended for non artists. Course content includes art throughout history, both Eastern & Western, providing global insight into various cultures and a core understanding of the visual language used to analyze techniques and materials used in painting, sculpture, and architecture. Class activities include viewing and analyzing images from the prehistoric period to modern day, attending field trips to museums and art exhibits, and keeping a written and visual journal documenting visual understanding of the art experiences explored in the course. This foundation studio course addresses visual dynamics on the 2D picture plane. Through the design process students explore visual elements and principles of organization. Projects cover technical skills, idea generation and development, and presentation. This course will provide the student with at least 5 works for portfolio. This foundation studio course focuses on the visual dynamics and basic design issues that underlie three-dimensional works of art and design. Students will create three-dimensional projects using a variety of sculptural materials and methods that explore the formal elements and underlying design principles. This course is an introduction to the basic principles and practices of drawing. Students will complete a variety of projects that emphasize observation, line, value, shape, texture, picture plane organization, perspective, use of materials, methods for developing drawings from initial sketch to finished drawing, and discussion of course concepts. This foundation studio course addresses color relationships, interactions and use in visual compositions. Pre- or Co-requisite: ART 110. This course is an introduction to history of digital media and the practical applications of design using digital images. Assignments build visual discernment, conceptual thinking, awareness of design issues and some design history. Using Photoshop, students learn to work with images and basic typography in increasingly complex design formats, and complete a design portfolio of 4-5 pieces. Pre-requisites: ART 110 with a grade of C or better. The course covers the study and practice of lettering using the broad pen and pencil to develop original calligraphy and calligraphy for reproduction. This course is an introduction to resizable (vector-based) graphics used in design applications such as logos, technical illustrations, diagrams, packaging, signage, animation, web and designing for mobile devices. Using Adobe Illustrator, students explore conceptual solutions while working with lines, shapes and paths in various graphic explorations. A final portfolio will be submitted. Note: It is recommended that students take ART 140 and 145, and be familiar with the MAC platform prior to taking the course. Pre-requisite: ART 110 with a grade of C or better. This is an introduction to the medium through the use of manual film cameras, light meters, black and white film processing and print enlarging. Craftsmanship is stressed. Students must have a manual film camera with manually adjustable lens openings, shutter speeds, and focus, as well as a working built in light meter. Photography courses require a substantial amount of student-purchased supplies, which may cost $200 or more, in addition to camera and text. Note: This course may be more suitable to those considering further work in photography, requiring a traditional film camera. For those wishing to take an introductory course that is digital and does not use film, please consider ART 157 Digital Photography 1. The course introduces photography based on digital image reproduction. Students will create direct files using a digital camera and reproduce prints using grade inkjet printers. Emphasis is on understanding color and black and white photography as a powerful creative tool in commercial and fine art photography. No prior study of photography is required. It is highly preferable to be able to shoot in the RAW mode rather than just JPEG. Note: Students must have access to a suitable digital camera with manually adjustable lens openings and shutter speed settings. This course is recommended as a first photo course for students who are not planning to make photography their career or as an auxiliary course for students who have taken or will take traditional/wet photography courses. An introductory course covering various aspects of the history, theory and practice of animation. This course includes a broad overview of traditional and computer animation techniques from the earliest experiments until today. Studio sessions of this introductory course will emphasize creating computer 2-D animations using the popular animation program, Flash. This course is an introduction to the nature and properties of clay. It provides students a range of experience in working with clay, including hand building and throwing techniques, firing processes and glaze application techniques. It provides a context for understanding historical and contemporary ceramics. The course includes painting on paper with water-based media including gouache, watercolor, and acrylic. Emphasis is placed on working from observation, exploration of materials and techniques, integration of wet and dry media, concept development, and presentation of completed works. Prerequisite ART 120 with a grade of C or better. This is a painting course designed for students who have completed fundamental studies of 2D design, drawing, and color theory. Emphasis is on working from observation, exploring color and technical application of acrylic or oil paints, and expressing ideas through concept and thematic development. Pre-requisites: ART 110, ART 112 and Art 120. A continuation of ART 157, the course adds additional content related to digital photography. Students explore more advanced photo concepts for shooting and presentation. Using images the students shoot themselves, and tools found in Adobe Photoshop, students create photographic illustration and art which can include image modification, use of the smart file, advanced PhotoShop editing techniques, and multiple image compositing. Prerequisite: ART 157 with a grade of ‘C’ or higher. This course is an introduction to the art of designing web sites. Students will be introduced to HTML markup language and software (such as Dreamweaver) for creating web pages, and techniques for designing web sites containing text and images. The emphasis will be on information structure, creation of design elements, and the creation of a web site that is easy to navigate and visually compelling. Students will learn to use HTML divs, tables, cascading style sheets, forms, and other components of web design. Students are recommended to take ART 147 prior to or at the same time as ART 264. Prerequisites: ART 140 and ART 145. A special learning experience designed by one or more students with the cooperation and approval of a faculty member. Proposed study plans require departmental approval. Projects may be based on reading, research, community service, work experience, or other activities that advance the student's knowledge in the field of art or related areas. The student's time commitment to the project will be approximately 35-50 hours. Similar to ART 271, except that the student's time commitment to the project will be approximately 70-90 hours. Similar to ART 271, except that the student's time commitment to the project will be approximately 105-135 hours. This course is a continued exploration of clay as it relates to hand built forms, building on basic skills gained in Basic Ceramics. Advanced hand building techniques, continued experimentation with glaze application, as well as an introduction to the chemistry and calculation of glazes and further development of students' understanding of historical and contemporary ceramics as it relates to the hand built form, will be the basis of this course. Prerequisite: ART 172. This course is a continued exploration of clay as it relates to wheel thrown forms, building on basic skills gained in Basic Ceramics. Advanced throwing techniques, continued experimentation with glaze application as well as an introduction to the chemistry and calculation of glazes and further development of students' understandings of historical and contemporary ceramics as it relates to the thrown form will be the basis of this course. Prerequisite: ART 172.